The living area is open to the kitchen and dining area. Living area. The kitchen has breakfast bar seating for additional dining space. The kitchen over looks the living and dining areas. Beautiful granite countertops and lots of cabinet space. Stainless steel appliances. The dining table seats 6. A half bath is located in the hallway. Bedroom 1 is the master and has 1 king bed, TV, private bath, views of the sound and access to the back deck. Master bedroom. Master bath with double sinks and stand up shower. Bedroom 2 has 1 queen bed and private bath. Bedroom 2 also has a TV. Bedroom 2's bath has a tub/shower combo. Bedroom 3 has a twin over full bunk bed and a jack and jill bath. The jack and jill bath has double sinks and a tub/shower combo. Bedroom 4 has 1 queen bed and shares the jack and jill bath. Bedroom 4 also has a TV. Bedroom 5 has a queen bed and private bath. Bedroom 5 also has a TV. Bedroom 5's bath has a tub/shower combo. The laundry room also has an extra refrigerator. This property is available for Sunday-to-Sunday rentals in peak summer! Located directly on Santa Rosa Sound this recently completed home is within easy walking distance of shopping, restaurants and night life. A short three-block walk across the island takes you to the white sands of beautiful Pensacola Beach. This home has a great room with kitchen that shouts let’s entertain. This great room space is ideal for a get together of family and friends. The master bedroom has a king bed, private master bath and door to the Sound front porch. In addition to the master bedroom there are two bedrooms with queen beds and private baths. Bedroom’s four and five share a Jack-and-Jill bath and one has a single queen bed and the other has a twin over full bunk. In addition to the washer and dryer, the laundry room also has a second refrigerator. 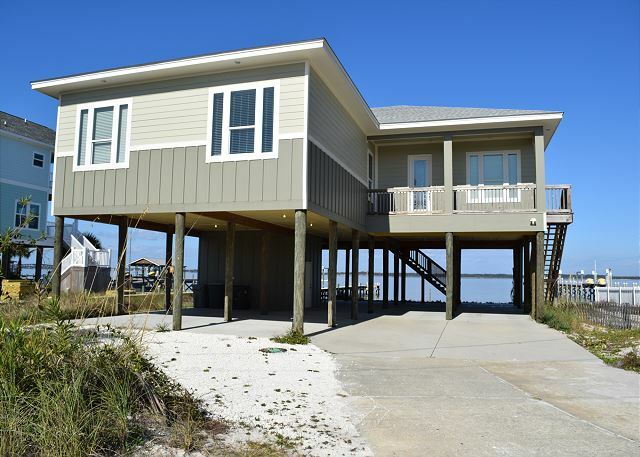 Guests in this home have the use of the shared pier in front of the home just to the west. The area under the home easily accommodates six vehicles. Paradise Beach Rentals were very accommodating, allowing us to check in early. The house was well kept and comfortable. The location is very convenient being able to walk to the beach and to local restaurants and bars. We're so glad you enjoyed your stay at 129 Panferio Drive! We hope to see you again very soon! Our family of nine loved our stay in 129 Panferio. The home was spacious and well-planned. The five bedrooms were perfect as everyone had a place to put everything that was brought. The grandchildren loved the bunk bedroom with adjoining bathroom. A bath for each bedroom was made everyone more comfortable. The kitchen had all we needed for preparing any meal. The speckled trout and bluefish our son and daughter caught in the sound behind the house were absolutely delicious! Good restaurants are very near! We loved Flounders and Hemingways! Great food! We thoroughly loved swimming in the sound, so clear and cool. Three small stingrays glided by everyday. Lovely. And the beautiful white sand beach is about a block or two across the street. The best of both worlds. All in all we were very happy with this beach home. Thank you for choosing Paradise Beach Homes as your vacation rental company! We are so glad you enjoyed your stay and it sounds like you enjoyed some wonderful cooking as well! We look forward to your return! Conveniently located , could walk to restaurants or short car ride. It would be nice to have a TV guide and/or info on how to use remotes. A luggage carrier in each bedroom would be nice, allowing access without leaving on floor. Overall well equipped and maintained. Overall good. House needs some maintainence. We had 4 couples. 4 were still in a career working capacity and 4 were retired. Very clean property with a great layout. Convenient to everything. Pictures don't do it justice. We were very happy with out stay. We had a wonderful vacation! The house was great - the pictures on your website don't do it justice! It was roomy, fit our group of 8 comfortably, and had very nice views of the sound. We would definitely rent again! Great place to stay if you're bringing a boat! We have stayed at this house 3 times in the past year. We love it. No complaints. The house is spacious and beautiful! Perfect for our large family and location is great! A trolley ride or walk away from all the places to go on the beach! 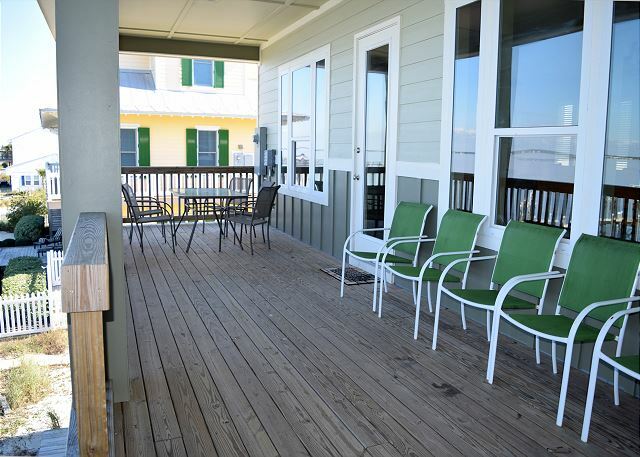 Wonderful bayside beach home with all the amenities a family would need. The home was clean and neat. Any issues were addressed immediately with the property management team. We will definitely be back next year! Very clean, lots of towels, may need more trash bags next year; When we arrived on Wed., garbage cans were full. Any chance of a stereo system for the future? we like sitting on the deck in the morning. The house is neve nice! I like that every bedroom has a bathroom! The kitchen, den and outside porch are the perfect size for social anything! My family and I had a great visit. The house provided walking access to some restaurants and other businesses. The pier allowed easy access to the sound for swimming and we could easily walk to the Gulf. My family came for a wedding this past weekend and half of our family stayed in the Panferio 129 home. It was very clean and had plenty of room. My son brought his fishing pole and loved spending time on the dock and hanging out in the water. We would definitely recommend this house for others to rent. What a great way to showcase Pensacola Beach to our first time visitors! The house set up was perfect for the casual wedding rehearsal dinner. The kitchen was open and has a good flow. The space below the house provided ample parking and space for tables and chairs for seating. The shared pier was perfect to provide the opportunity to set out a crab trap and teach the out of towners how to throw a cast net. The bedrooms and bathrooms are well appointed. The high ceilings throughout the house cause the house to feel really spacious. Enjoyed the stay. The house was clean and met expectations. The only negative was that the house was advertised to have a gas grill. This was not the case. Overall, enjoyed we enjoyed the stay. We had a wonderful experience all the way around, from the terrific staff at Paradise Homes through the excellent VRBO home. The house was as described and perfect in all ways, accommodating all included. Great times had. The property was wonderful, a few minor items were messed up in the house but over all it was a great stay and a wonderful location for a sunset wedding! One thing that it could use is a elevator for those older in age! However we had a blast! Thank you for the use of your location! The house was very nice. thank you so much for working with us. Will definitely use you again. Thanks so much! We really enjoyed the home! The location was great. Close to restaurants and beaches. It was clean. We fished off the dock. We ate at Peg Leg Pete's and McGuires. They were awesome. We parasailed, that was awesome. We toured the historic district of Pensacola. Very interesting. I would highly recommend this property! We had a blast. Perfect for all of the families and kids that stayed. Home is brand new and very clean and very comfortable. Our family had a fantastic time at your beach house. I can't think of a thing that would have made our stay better. The home was beautiful and clean. The staff at PBH were helpful and friendly. Everything about our experience with PBH exceeded our expectations. A+ all the way!!! This was a great place to stay. Owner of the house was so nice; always willing to meet and available if I had any questions. I needed a beach home, because my family was coming down for my graduation. They loved the home and the experience. Home was very clean and spacious. If I had to get another beach home, I would stay here again without hesitation. I recommend this place to everyone I come in contact with. Really great home and service.